Locking all doors and tailgate. Switch on the courtesy lighting remotely. starting the engine; refer to the information on “Starting the engine” in Section 2. Make sure that the correct battery type is being used, and that the battery is in good condition and inserted correctly. Its service life is approximately two years: replace it when the message “KEYCARD BATTERY LOW” appears on the instrument panel (refer to the information on the “RENAULT card: battery” in section 5). 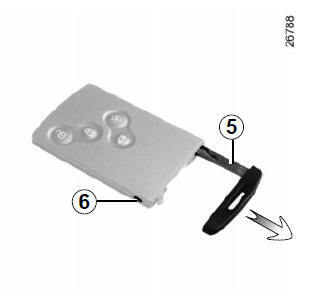 This varies according to the surroundings: when handling the RENAULT card, it is important to make sure that you do not lock or unlock the doors by inadvertently pressing the buttons. When the battery is flat, you can still lock/unlock and start your vehicle. Refer to the information on “Locking/unlocking the doors” in Section 1 and “Starting the engine” in Section 2. Driver’s responsibility Never leave your vehicle with the RENAULT card inside and never leave a child (or a pet) unsupervised, even for a short while. They may pose a risk to themselves or to others by starting the engine, activating equipment such as the electric windows or by locking the doors. when the RENAULT card battery is drained, flat battery, etc. Press button 6 and pull on key 5 then release the button. Please refer to the information on “Locking and unlocking the opening elements”. 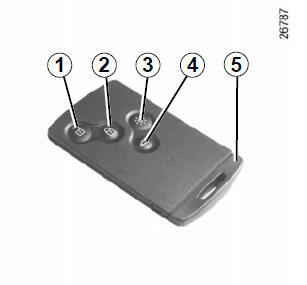 Once you have accessed the vehicle using the integrated key, replace it in its housing in the RENAULT card, then insert the RENAULT card into the card reader to start the vehicle. Advice Avoid leaving the card in hot, cold or humid areas. Do not keep the RENAULT card in a place where it could be bent or damaged accidentally, such as in a back pocket of a garment. Replacement: need for an additional RENAULT Card If you lose your RENAULT card or require another, you can obtain one from an authorised dealer. If a RENAULT card is replaced, it will be necessary to take the vehicle and all of its RENAULT cards to an approved Dealer to initialise the system. You may use up to four RENAULT cards per vehicle.